The Pickled Fairy & Other Myths is a small family business and the owners for the whole 24 years have been Jenny and Rex Diggins. Fairy Queen Jenny, now a granny fairy, takes care of the fabulous team of fairies and keeps creating fun new products, stories, parties and activities for Fairyland. It’s Wizard Rex we go to if we need to sort any of the practical aspects of running Fairyland. At certain times of the year, like during the Fremantle Festival, our wizard is likely to morph into a pirate, King Neptune, or even a dragon! 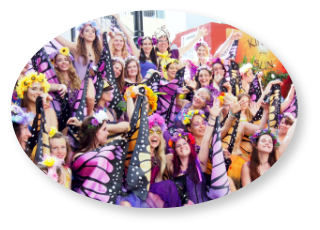 Fairyland is nothing without its fantastic fairies, and we have a wonderful bunch of delightful fun - makers, looking forward to meeting you. Once a fairy, always a fairy, and anywhere in the world you might meet one of our fairies who has flown far away for a while. They always have a story of Fairyland to tell!